Carol Hill here…the only one of the four women who run the WISE Enquiries Agency who likes to (or can!) bake. 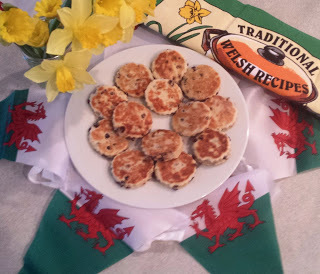 With the cooler weather coming along I decided it would be a good time of year to bake a good supply of Welsh cakes – to share with my colleagues. If you’re not familiar with Welsh cakes, all I can say is you’re missing out on a traditional treat. I’ve given you the recipe below, if you fancy giving them a go. I’m going to pack some up in a nice tin and deliver them to Mavis and Althea over at the Dower House this afternoon. Maybe they’ll have some with their afternoon cuppa. 7) Cut rounds and place them on a large, cold plate 8) Put one cake on your griddle to test temperature – the heat needs to brown the cake without burning it. You flip it over just once, then cook until it’s no longer squishy – meaning the center has cooked. This test allows you to work out temperature and timing. Usually the first one doesn’t work out too well, which is why you try just one, rather than loading the griddle. 9) Load the bakestone/griddle and turn cakes just once. 11) To be served cold, without butter, jam, or anything at all – they are perfect just as they are! Either store in an airtight container for a week, or freeze (for up to three months) and allow to thaw naturally.